The Triumph Herald is a small two-door car introduced by the Standard-Triumph Company of Coventry in 1959 and made through to 1971. Giovanni Michelotti was commissioned to style the car by the Standard-Triumph board and immediately produced designs for a two-door saloon with a large glass area that gave 93 per cent all-round visibility. It was decided that the car should have a separate chassis rather than adopting the newer unitary construction. Every panel – including the sills and roof – could be unbolted from the car so that different body styles could be easily built on the same chassis. The car was launched at the Royal Albert Hall in London on 22 April 1959. An addition to the original coupé and saloon models, a convertible was introduced in 1960. It was launched with a 948cc engine then a 1147cc and finally with a 1296cc engine, which produced 61 bhp. 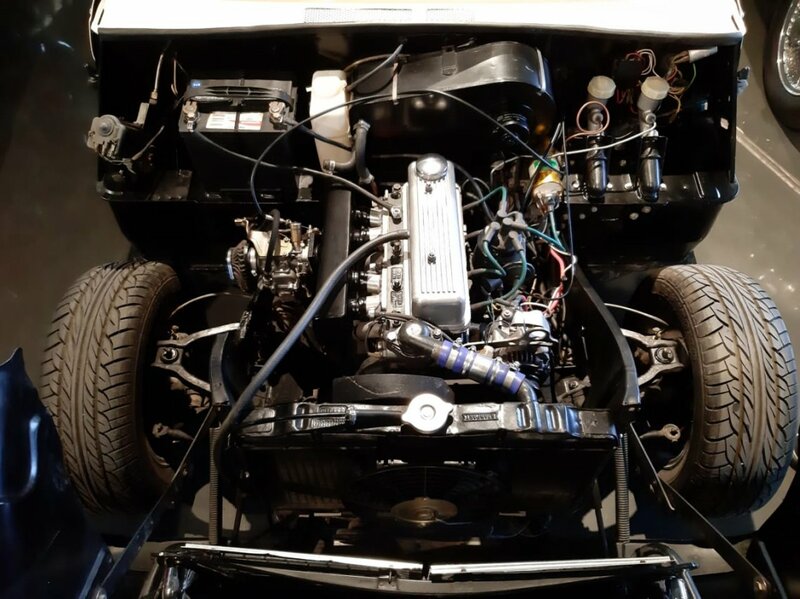 Our Triumph Herald at the Nostalgia Classic Cars has 54,000 miles on the clock comes with a manual gearbox, black leather seats, a beautiful wood-paneled dashboard and with handcrafted wood rim steering wheel from the renowned British steering wheel maker Moto Lita. Over the years they supplied Sir Stirling Moss, Paddy Hopkirk (winner of the Monte Carlo Rally) Timo Makkinen (who drove using a Moto-Lita in the Mini Works Racing Team) the Sultan of Brunei and many car manufacturers like AC Cars, Shelby Mustang, Jaguar, Jensen, Tvr, Rolls-Royce and Aston Martin used Moto-Lita steering wheel as original equipment for their cars. It takes around 12 man-hours to complete each steering wheel. Moto-Lita defines the meaning of the true British craftsmanship.